On this blog I will be sharing my reviews on Fantasy (and some Science Fiction) books, what I think on the magic systems and the worlds created by the authors, and what my favourite reads are. First Paragraph - First Chapter - Tuesday Intro is hosted by Bibliophile By the Sea. 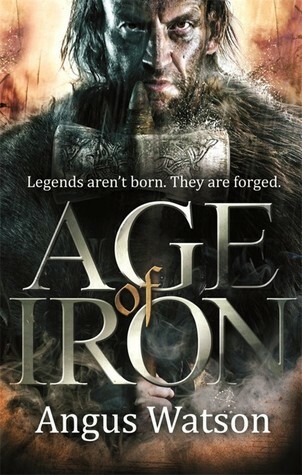 I started reading Age of Iron by Angus Watson just this morning. In fact, I have read the exact amount as what you have read with this post. It is the first book in a new fantasy series and the author's fictional debut. The book isn't due out until September but I received a copy from NetGalley for review. "Mind your spears, coming through!" Dug Sealskinner shouldered his way back through the ranks. front rank was for young people who hadn't learned to fear battle and old men who thought they could compete with the young. Dug put himself halway in that last catergory. He;s been alive for about forty tears, so he was old. And he wanted to compete with the young, but grim experience had unequivocally, and sometimes humiliatingly, demonstrated that the young won every time. even when they didn't win they won because they were young and he wasn't. What do you think? Would you keep reading? I like a good fantasy, so I might give this a try. Fantasy is my genre and this book is being marketed as being similar to (and therefore perfect for fans of) Game of Thrones and Joe Abercrombie. Just based on the cover and fantasy factor, this would be a no for me, but I hope that you love it. I have to say that the front cover doesn't do it for me either. I get the impression it is going to be full of battles. Time will tell! This looks good and I would read on. liking the intro, cover too dark or warlike for me... enjoy your reading! I'm not sure about the cover, but the opening has me curious. I had to look up the synopsis--I couldn't resist. It does sound like it will be good. I hope you enjoy it! I like a good fantasy time and again, but I'm not sure about the ones predominantly about war. I would read on for a few pages to see if it was a good fit for me. Thanks for sharing. Hi Rita_h, I've just added subscription links and follow by email links on the sidebar in order to follow me now. I liked this one. Laughed at his ideas about the young and old. I love the start of a new series. So much promise and discovery. Thanks for visiting my blog. I'm a sucker for a good fantasy series. Over the first quarter of the year, I spent time finishing off series that I was currently reading as I had so many on the go. Now I feel able to take on some new ones!